From an earlier post, you may recall that TOT stands for Trikes Only Tour (or more politely, Trikes Optional Tour.) Place the tour in Idaho, home of the bigger spud, and it becomes TaterTOT. This year was the twelfth annual event, and our first time to go. It was well-attended by folks from all over the country, the weather was good, and moose sightings abounded. Headquartered at the Fairbridge Inn in Kellogg, Idaho, this TOT is loosely organized, with rides posted on a whiteboard the evening before and no sign ups required. You just show up at the appointed hour and off you go. Most of the routes are on rail trails (bike paths using the routes of disused railroads) so grades are gentle. The one mass event was Monday evening’s dinner ride, seven miles to an outdoor barbecue and beer place called the Snake Pit, followed by the return ride with lights on. The event begins Saturday afternoon and runs through Wednesday, but people come and go the entire time. The peak was probably Monday morning for the group photo shoot. 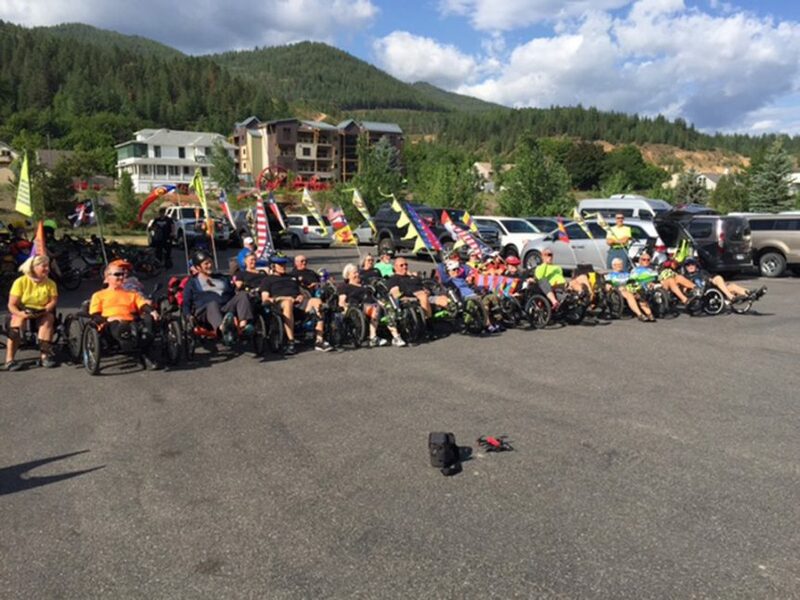 The sight of sixty or more trikes lined up in front of the hotel, flags waving in the breeze, was stirring to those of us who can ride for hours back home without seeing another trike. As the number of trike enthusiasts has grown, so has the TaterTOT. Next year, all the rooms at the inn will be reserved for TOTers. This year, we got the last available room sometime last December. We made our reservations for next year’s Saturday through Wednesday event on Thursday morning before we left.